Pakistan has successfully flight-tested Burraq, its first armed drone. The new unmanned combat aerial vehicle (UCAV) fired and precisely hit both still and moving targets with Barq, a laser-guided missile it carried under its wings. Based on Chinese CH-3 specification,the indigenously developed Burraq can carry 100-kilogram payload. It is a medium altitude long endurance (MALE) drone which can stay up for 12 hours. The payload can be laser-guided missile Barq, similar to Chinese AR-1 missiles, or a pair of precision guided small-diameter bombs like the Chinese FT series PGM. With its successful Burraq test, Pakistan joins eight other countries — the United States, South Africa, France, Nigeria, Britain, Iran, Israel and China — which have already put weapons onto unmanned aircraft, according to the New America Foundation. Of these, only the US, Britain and Israel have successfully deployed armed drones during military operations, the foundation said. Pakistani military's interest in armed drone technology is based on its direct knowledge of how effective American Predator drones have been in targeting and eliminating Taliban terrorists in Pakistan's FATA (Federally Administered Tribal Areas). The objections to US drone strikes in Pakistan have mainly been due to the political sensitivity with violation of sovereignty, not due to lack of precision and effectiveness. Top TTP terrorist leaders Nek Mohammad, Baitullah Mehsud and Hakimullah Mehsud have all been killed in US drone strikes. Pakistan is hoping to emulate the success of American drones in FATA by deploying Burraq in its ongoing anti-terror campaign in Waziristan and other tribal agencies. Burraq has the ability to linger over targets for long periods of time, gather intelligence and fire deadly missiles precisely at much lower cost than fighter planes like F-16 and JF-17. Drone war is almost synonymous with Pakistan, where for years American drones fought back Taliban and al Qaeda operations across the border from Afghanistan. It’s a tremendously contentious policy, with American planes dropping bombs on insurgents within Pakistan’s Federally Administered Tribal Areas (and, often, killing civilians in the process). What happens to the drone war when American forces leave Afghanistan? Turns out Pakistan may use its own drone to battle insurgents. After years of development, Pakistan is putting the finishing touches on the Burraq, an indigenously made armed drone that successfully test-fired a laser-guided missile earlier today. The Burraq bears a strong resemblance to China’s CH-3 drone, with forward canards, a pusher propeller, and long, back-sloping wings. Today's announcement, from the Twitter account of Pakistan’s military spokesman Asim Bajwal, notes that the Burraq fired successful on both still and moving targets, that the new drone can operate in all weather, and with pinpoint accuracy. Before building their own drones, Pakistan tried to acquire some from the United States, but those requests were refused. The United States recently relaxed restrictions to allow for the export of armed drones, but it’s unclear whether America would be willing to sell any to Pakistan in the future. Why would Pakistan want armed drones of its own? Drones like the Burraq are counter-insurgency weapons, which combine long flight times, surveillance video, and guided missiles to watch for and attack people believed to be part of violent groups. Pakistan’s Federally Administered Tribal Areas (FATA) sit on the border with Afghanistan, and following the U.S.-led invasion of Afghanistan in 2001, FATA became an operating base for the Taliban. In 2009, following a push by the Taliban into other cities in Pakistan, the Pakistanis launched a ground campaign to drive the Taliban back. Thousands of refugees fled the area to avoid the violence. Drone strikes are an alternative to fighting insurgencies on that scale from the ground. And with the Burraq, Pakistan can now do drone strikes on their own, without the United States. Pakistan has no encrypted GPS system of its own making its drones prone to hacking. Singh: "Pakistan has no encrypted GPS system of its own making its drones prone to hacking." Pakistan is set to become the fifth Asian country to use China's domestic satellite navigation system which was launched as a rival to the US global positioning system, a report said Saturday. The Beidou, or Compass, system started providing services to civilians in the region in December and is expected to provide global coverage by 2020. It also has military applications. Thailand, China, Laos and Brunei already use the Chinese system, which currently consists of 16 operational satellites, with 30 more due to join the system, according to English-language China Daily. Huang Lei, international business director of BDStar Navigation, which promotes Beidou, told the newspaper the company would build a network of stations in Pakistan to enhance the location accuracy of Beidou. He said building the network would cost tens of millions of dollars. American website Defensenews.com reported early May that Pakistani military experts were in favour of using the Chinese system, even though the availability of the signal could not be guaranteed in case of conflict. But according to one of them, Pakistan cannot place its trust in the United States. “Pakistan's armed forces cannot rely on US GPS because of its questionable availability during a conflict that has overtones of nuclear escalation,” former Pakistan Air Force pilot Kaiser Tufail told the site. India is Developing its own IRNSS-GPS satellite system of 7 satellite of 3 Satellite is already in Orbit and 5 more will join and complete system will start end of 2015 . Singh Told you that when it comes to strategic matters then you can not rely on third party, you need your own system, and Pakistan is far far away to have such system. you GPS Guided missile will not work without reliable GPS service. Pakistan and the United States moved closer to a billion dollar defense deal this week, after U.S. authorities notified Congress of a proposal to supply helicopters and missiles to sharpen up Pakistan's counter-terrorism efforts. U.S. ally Pakistan, a nuclear-armed nation of 180 million people, is fighting a Taliban insurgency in its northwest, a separatist insurgency along its Iranian border in the west, and has a heavily militarized and disputed border with arch rival India in the east. The $952 million proposal involves the United States supplying Pakistan with 15 AH-1Z attack helicopters, 1,000 Hellfire missiles, engines, targeting and positioning systems and other equipment. But negotiations are not complete. The helicopters and weapon systems were designed for counter-terrorism and counter-insurgency operations, especially in the mountainous Taliban strongholds along the Afghan border, the U.S. Defense Security Cooperation Agency said. On Monday, the agency notified Congress of the proposed sale, noting it would "contribute to the foreign policy and national security of the United States by helping to improve the security of a country vital to U.S. foreign policy and national security goals in South Asia". The equipment "will not alter the basic military balance in the region," the agency said. Pakistani defense officials did not reply to requests for comment. The United States has been pushing Pakistan to take action against the Taliban as it withdraws most of its combat troops from neighboring Afghanistan, which is facing its own Taliban insurgency. James Hardy, the Asia-Pacific editor for IHS Jane's Defence Weekly, told Reuters the helicopters would help modernize Pakistan's aging fleet, some of which had problems with spares and maintenance. "Attack helicopters give you 'loiter' capability - you can hang around, find the target, knock it out," he said. "Right now Pakistan is using its fast jets for counterinsurgency work." Pakistan is also trying to finalize a deal to buy eight submarines from China for a reported cost of between $4 billion to $5 billion. China supplied 51 percent of the weapons Islamabad imported in 2010-2014, according to the Stockholm International Peace Research Institute (SIPRI), which tracks global arms sales. This year's budget allocated $7 billion to the military. The police received $800 million. New Delhi: Intelligence agencies have, in a classified note to the Centre, informed that both Pakistan Rangers and Army are deploying surveillance drones to snoop on Indian security forces along the borders in Kashmir and Rajasthan primarily with a view to monitor their patrolling activities and deployment pattern so that they can push through nearly 200 militants waiting at the launch pads in the region. Senior intelligence officials said they had been receiving reports about drones in the border areas and further investigations revealed that this was being done primarily with a view to keep a watch on the movement of Indian security forces. Interestingly, what has baffled security agencies is that surveillance is being mounted using drones even in the Rajasthan sector, which indicates that the Pak Rangers and Army may well try to push through subversive elements from this new route which can be a cause of concern. However, security agencies, sources added, had already taken preventive measures to plug any major infiltration attempts in the days ahead. The security establishment in New Delhi is taking these developments extremely seriously as with the onset of summer season the infiltration trend starts showing a sharp increase. What is also significant is that the number of militants operating in the Valley is said to have dropped to the lowest ever since militancy broke out in the Valley more than two decades ago. In fact, some security experts estimate that the number of actual top “operation militants” in the Valley may only be 25. These so-called “signature” strikes have been responsible for killing more al Qaeda leadership targets than strikes directly targeting high-value leaders, especially in Pakistan, where the group’s leadership can be difficult to find, current and former U.S. officials said. The Jan. 15 strike that killed Messrs. Weinstein and Lo Porto was a signature strike. Under a classified addendum to the directive approved by Mr. Obama, however, the CIA’s drone program in Pakistan was exempted from the “imminent threat” requirement, at least until U.S. forces completed their pullout from Afghanistan. The exemption in the case of Pakistan means that the CIA can do signature strikes and more targeted drone attacks on militant leaders who have been identified without collecting specific evidence that the target poses an imminent threat to the U.S. Being part of the al Qaeda core in Pakistan is justification enough in the Obama administration’s eyes. JODHPUR: Pakistani troops have been using every opportunity to spy on the Indian side using UAVs or cameras along the border, a BSF officer said on Saturday. BSF DIG (Rajasthan Frontier) Ravi Gandhi said that Pakistan was making the best use of technology to keep an eye on the Indian side but had stopped the practice after objection was raised. However, there were still some concerns in other areas. Reportedly BSF troops had spotted a moving light as high as 150–400 metres close to the border in Pakistani territory in April. "We do not know what exactly it was. But assuming them to be some drone or a UAV kind of thing, we took up the matter with Pakistani Rangers through a protest note after which the practice was dropped," Gandhi said. "But then they started installing cameras close to the border at a number of places in Barmer, Jaislamer, Bikaner and Ganganagar," Gandhi said, adding that all the cameras were removed from the border of Rajasthan Frontier after "we objected this move but some are still there on the boarder in other frontiers". "We took a serious objection on these overtures of Pakistan after which the Rangers removed these cameras," claimed Gandhi. "These might be attempt of Pakistani Rangers to explore the possibilities of getting their moles, may be some smugglers with drug or arms slip into the Indian territory in the thick on night," said a police official citing their links in the villages along the border in Indian territory. Meanwhile, BSF is also grappling with the issue of illegal mining of gypsum in Bikaner region. BSF patrolling teams have seized a number of trucks and caught a number of persons mining close to the border. "We have caught a number of gypsum mining activities close to the border in Bikaner region and have handed over the trucks and persons to the Bajju police post in April and May," Gandhi said. An unmanned Pakistani aircraft killed three suspected terrorists Monday, marking the first time that the country’s military has used drone technology on the battlefield, officials said. In March, Pakistan’s military declared that it had successfully armed an indigenously produced drone, which it calls the Burraq, with a laser-guided missile. But the weapon had not been used in combat until now, officials said. Maj. Gen. Asim Bajwa, a spokesman for the military, said in a brief statement that three “high-profile terrorists” were killed in the strike in the Shawal Valley in northwestern Pakistan. Bajwa did not identify them but said details would be forthcoming. With the announcement, Pakistan appears to have joined a handful of nations that use armed drones as instruments of war. Earlier this year, the New America Foundation said there is evidence that eight other countries — the United States, South Africa, France, Nigeria, Britain, Iran, Israel and China — have placed weapons onto unmanned aircraft. At the time, the foundation said the United States, Britain and Israel were the only nations that had fired a missile from a drone during a military operation. Pakistan’s drone program has been rapidly accelerating since it was announced in late 2013. The Pakistani military initially said it would use drones only for surveillance. But it abandoned that stance this year in the aftermath of a terrorist attack on an army-run school that killed about 150 students and teachers. Now, it appears, both Pakistan and the United States will be carrying out drone strikes along the Pakistan-Afghanistan border. It was not clear whether Pakistan and the United States will coordinate their use of armed drones. Since 2004, the United States has carried out hundreds of drone strikes on Pakistani soil, targeting al-Qaeda and other Islamist militant groups. Those strikes, the latest of which occurred late last week, had been deeply unpopular with the Pakistani public. Some of that opposition has subsided as Pakistan’s military began its latest offensive against militants. Since that operation started last summer, officials say they have cleared Islamist militants from much of the country’s tribal belt. But there are signs that the army is running into a tougher-than-expected battle in the Shawal Valley. In July, the army announced that it had begun a final assault on the valley, which straddles North and South Waziristan and includes a network of trails and tunnels to Afghanistan. The army was met with fierce resistance. For much of August, the military appeared to have relied on repeated airstrikes in a bid to weaken militant positions in the valley. On Aug. 20, however, the military again announced that a ground operation was underway in the valley. Pakistan’s decision to introduce armed drones on the battlefield could unnerve arch-rival India and neighboring Afghanistan. So far, the Pakistani military has not announced its doctrine for using drones on home soil or specified whether they also could be deployed for cross-border operations. Pakistan has not released details about the range of its drones, but some analysts estimate that the aircraft can fly about 75 miles. There is also uncertainty about what procedures Pakistan’s military has in place to limit civilian casualties during a drone strike. Some foreigners kidnapped by militants in Pakistan or Afghanistan, for example, are feared to still be held captive in Pakistan. Pakistan has made its first acknowledged operational strike using its Burraq armed UAV, which analysts say shows a higher than expected level of sophistication in the military's real-time targeting capabilities. The strike was confirmed via the Twitter account of the head of the military's media branch, Inter Services Public Relations, Maj Gen Asim Bajwa. A tweet dated Sept. 7 announced the first "ever use of Pak made Burraq Drone today. Hit a terrorist compound in Shawal Valley killing 3 high profile terrorists." It also said further details would follow. The Shawal Valley in North Waziristan is the scene of a Pakistan military operation to clear out the last pockets of the Pakistani Taliban (TTP) and affiliated terrorist groups from Pakistani soil as part of the wider Operation Zarb-e-Azb. "The Burraq and its targeting and command structure are obviously very much more sophisticated than many of us had imagined, spurring belief that [China's] influence, cooperation and input may have been considerable", said analyst Brian Cloughley, a former Australian defense attache to Islamabad. "This is not to denigrate the work of the drone manufacturer, NESCOM, which is an efficient organization, but it is extremely doubtful if its own drone technology capability is on a level that this development appears to reveal." The Burraq and the similar Shahpar, which is said to be able to be armed, are widely believed to at least be developed from the Chinese CH-3 UAV if not license-produced versions by Pakistan's NESCOM. Despite this milestone, there are "wider implications of drone employment [that] must be considered," Cloughley said. "In the tribal areas there is already widespread fear of drones and resentment against the government and the armed forces for the many civilian deaths that have resulted from US drone strikes. Drones and missiles don't display national identification, but even if the tribes could distinguish between US and Pakistani strikes, they would blame Islamabad for their results." Analyst Kaiser Tufail said there are ethical issues, but Pakistan's targeting will likely be more discretionary. "The usage of UAVs by foreign powers in other sovereign states has been a major issue, alongside the moral aspect of virtually 'clicking' to kill through impersonal and remotely actioned 'computer games,' " he said. However, "These aspects are not likely to hound countries like Pakistan, who have an own autonomous capability where the identity of insurgents is known much better than the US, which has been notorious for administering 'Hellfire' to wedding parties and funeral gatherings." For the Pakistan Air Force, he said, this is the dawn of a new era. "The future of warfare is getting more and more virtual," said Tufail, a former Air Force pilot. "By using UAVs, the risk of exposing pilots to being shot down is eliminated, besides the possibility of flying missions for days and weeks on end. The bio-support systems like ejection seats, oxygen supply and pressurization systems are obviated, lightening up the aircraft for more range/endurance and payload." he said. Operationally, however, this is considerable step forward. "The main advantage that I see is that air support does not have to be called in from long distances once a threat has emerged, and which can hide by the time the piloted aircraft arrive on the scene," Tufail said. "UAVs can loiter for hours, so the vulnerability of insurgents is also round-the-clock." Pakistan’s creation of its own unmanned aerial vehicle (UAV) ushers the country into an elite class of a few nations with combat drones, including the United States, the United Kingdom, and Israel, according to data from the New America Foundation. Pakistan has long battled the presence of Taliban militants hidden away in North Waziristan, a tribal region bordering Afghanistan. The Pakistan-Afghan border also offers refuge for loyalists of the Islamic State, according to members of the Afghan parliament. Until this week, the United States has monopolized drone strikes targeting militants in Pakistan’s tribal regions. North Waziristan has been pelted with more CIA drone strikes than any other place on earth, according to a recent report in The Guardian. Despite a lack of help from America, Pakistan got its hands on missile technology somewhere else. According to a recentReuters report, analysts say the Burraq drone bears an uncanny likeness to UAVs created by China. India will buy 10 armed drones from Israel at a cost of $400 million, the Economic Times reported Friday, citing sources within India’s ministry of defense. Officials from Israel Aerospace Industries were currently in India and exploring joint production of drones, the report added. The Heron TP drones will be operated by India’s air force, and their procurement was being fast-tracked by India’s federal government. The deal was approved by India last week and the drones might be commissioned within a year, the paper reported. India, which already uses an unarmed version of the drone for surveillance and intelligence gathering, sees the armed drones giving it an edge in combating cross-border scenarios, the paper reported. They can carry payloads of over 1,000 kilograms (about 2,200 pounds) and will be fitted with air-to-ground missiles. The drones are particularly useful in attacking targets in scenarios that pose a risk to the lives of soldiers, the newspaper reported, citing the officials. India is investing in a program to build its own unmanned aerial vehicles, all commonly called drones, but is some years away from actually commissioning one for use in combat, the paper reported. The program, started in 2006, is being developed by the country’s umbrella organization for defense technology, the Defense Research and Development Organization, and the contract to build the first version, Rustom 1, was awarded to state-owned Hindustan Aeronautics Limited and Bharat Electronics Ltd., Mint newspaper reported in 2010. In early September, the government of Pakistan joined an exclusive club. It became the fourth government in the world — following the United States, the United Kingdom and Israel — to use an armed drone to conduct a targeted killing. In doing so, it shattered the assumption that armed drones and the practice of targeted killing will diffuse slowly to the rest of the world. As a scholar of terrorism and political violence, I see this new deployment of drones as more than a mere tactical move by Pakistan. This incident should make Washington reconsider whether its use of drones for targeted killing will soon usher in unpredictable or even deadly consequences. Unlike the U.S. and U.K., the Pakistani Army used a drone to kill enemies on its own territory. The strikes were part of its long-running campaign to pacify Waziristan. Since August, the army has been engaged in a bitter campaign to expel militants nested in the Shawal Valley, an important conduit of weapons and personnel into Afghanistan. Despite being supported by manned aircraft, the Pakistani ground forces have been stalled due to fierce resistance from Taliban-linked tribal forces in this mountainous valley. The drone strikes are against “high profile terrorists,” according to ISPR Director-General Asim Saleem Bajwa. They should be seen as an effort to break the will of the militants and clear the region. The drone used in this strike was a homemade “Burraq” drone designed for surveillance missions, but converted to carry and deploy a missile under remote control. While it lacked much of the range and sophistication of the US-made Predator and Reaper drones, this drone was sufficient to carry out a targeted killing with a reasonable level of accuracy. This example may lead other states in possession of less sophisticated drones, such as India, Russia and Iran, to begin to contemplate whether their technology will be good enough to be converted for a similar strike. If nothing else, it shows that some surveillance drones are more “dual use” for targeted killing than many experts have assumed. It also illustrates how drone technology is diffusing across the international system in complex ways. Powerful suppliers such as China are playing a role in providing technology and training to countries forbidden from receiving American exports, such as Nigeria and India. A number of experts have suggested that China either directly assisted Pakistan’s development of an armed drone or that Pakistan at least relied heavily on Chinese designs. Several terrorists were killed late on Thursday in South Waziristan in the first night-time strike by Pakistan’s first indigenous armed drone, ‘Burraq’, Inter Services Public Relations (ISPR) said. It was Buraaq’s first airstrike in the dark hours and took place with pinpoint accuracy, a source told The Express Tribune. The development took place after airstrikes by fighter jets killed 21 militants near the Pak-Afghan border, said an ISPR press release. “Twenty-one militants were killed in air trikes in Rajgal and Tirah areas of Khyber Agency,” Inter Services Public Relations (ISPR) said in a statement on Wednesday. Earlier on October 11, at least 22 terrorists were killed in air strikes by Pakistani warplanes in the North Waziristan tribal agency before dawn. Six compounds of terrorists were decimated in the air raids in Shawal Valley, according to the military’s media wing. The strategic valley is located on the confluence of borders between North and South Waziristan agencies. The military has been engaged in a massive operation, codenamed Zarb-e-Azb, in North Waziristan since mid-June 2014. Most parts of the agency, once a stronghold of local and foreign militants, have been purged of terrorists. However, some militants are holed up in the thickly forested Shawal Valley, which is now regarded as the last bastion of militants. The military mounted a ground offensive in Shawal in August, this year, after softening targets with air strikes. When Pakistan’s military claimed its first attack in October using a home-built drone to hit a Taliban stronghold, western officials were quick to search for clues to a Chinese connection. Experts say Pakistan’s “Burraq”, one of the first two indigenously built armed drones, bears a striking resemblance to China’s CH-3. Officials lauded the drone that equipped Pakistan with a technology that has been denied them by the US in 15 years as a key Washington ally in the campaign against terror. Though Pakistani officials deny suggestions of Chinese involvement in the country’s drone programme, western officials remain unconvinced as military links between Beijing and Islamabad tighten. Earlier this year, China confirmed an agreement to sell eight submarines to Pakistan in Beijing’s largest ever single defence export order. Mr Felstead’s reference to Russian components is most visible in the case of the JF-17 “Thunder” fighter jet, jointly manufactured by China and the Pakistan Air Force at its Pakistan Aeronautical Complex facility just north of Islamabad. A senior Pakistan defence ministry official confirmed that the JF-17, which will become the PAF’s main second-line fighter jet, will be “powered for the foreseeable future” with the Russian-built RD-93 engine, overlooking Beijing’s offer of a Chinese engine. Pieter Wezeman of the SIPRI says Chinese military equipment is at a disadvantage for not having been used in conflict situations, unlike hardware from western suppliers which comes with a combat history. “The only place where Chinese equipment is known to have performed alongside equipment from other suppliers is Pakistan,” he notes. In the case of Pakistan’s use of its first armed drone, Mr Wezeman says it is important to remember that it was used against Taliban targets in a remote region along the Afghan border, and it was not challenged by enemy aircraft. “One has to be careful before one sees this as a breakthrough,” he adds. Still, western defence officials say Beijing’s strategy of offering significantly lower prices and a virtual absence of political strings gives China a rising presence in international markets. Rana Tanveer Hussain, Pakistan’s minister of defence production, has confirmed that half of the eight submarines will be built at the Karachi shipyard and engineering works, boosting Pakistan’s shipbuilding capacity. “The two projects [building four submarines in China and four in Pakistan] will begin simultaneously,” he said, while commending China as an “all-weather friend”. #Chinese drones fill #US gap as #America's #MidEast allies buy from #China http://www.theaustralian.com.au/business/wall-street-journal/chinese-drones-fill-the-gap-left-by-us-bans-on-saudi-arabia/news-story/542a5229ab099d61a30b29c2ed5c0327 Satellite images have revealed powerful new weaponry at a Saudi runway used for military strikes in Yemen in October. Three Wing Loong drones appeared, Chinese replicas of the US Predator with a similar ability to stay aloft for hours carrying missiles and bombs. The same month, another Chinese military drone, the CH-4 Rainbow, appeared in a photo of an airstrip in Jordan near the Syrian border. Other commercial satellite images have since revealed Chinese strike and surveillance drones at bases used by Egypt and the United Arab Emirates. These images and others now being scrutinised in international defence circles add to increasing evidence that military drones exported by China have recently been deployed in conflicts in the Middle East and Africa by several countries, including US allies that the US blocked from buying American models. For the US, that is a strategic and commercial blow. The US has long refused to sell the most powerful US-made drones to most countries, fearing they might fall into hostile hands, be used to suppress civil unrest or, in the Middle East, erode Israel’s military dominance. Britain is the only foreign country that has operated armed Predators and Reapers, the most potent US systems for offensive drone strikes, according to people familiar with US sales. The Obama administration, while seeking to facilitate exports under close regulation, led efforts to forge a global “drone code” that would curb proliferation and keep the weapons from misuse. But China is filling the void. State companies are selling aircraft resembling General Atomics’s Predator and Reaper drones, at a fraction of the cost, to US allies and partners, and to other buyers. 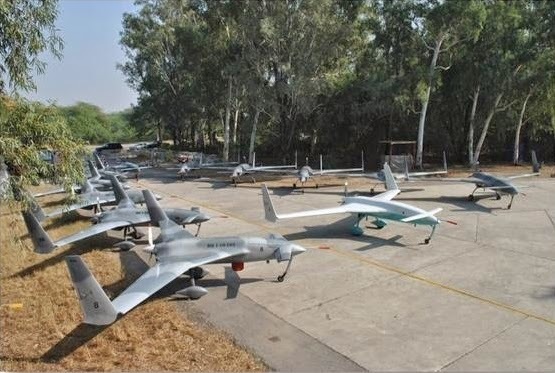 Pakistan will reportedly import 48 Chinese drones in what a Chinese military observer said must be the largest such arms deal of its kind. Announcing the deal on its official Facebook account on Sunday, the Pakistan Air Force's Sherdils Aerobatic Team did not reveal how much it was worth, when it was struck or when the Wing Loong IIs will be delivered. But the air force academy aerobatics team announced that in the future the Pakistan Aeronautical Complex Kamra and the Aviation Industry Corporation of China's Chengdu Aircraft Industrial (Group) Company will jointly manufacture the drones. Wing Loong II, made by Chengdu Aircraft Industrial (Group) Company, is a high-end reconnaissance and strike multi-role endurance unmanned aircraft system. It made its maiden flight in February last year, the Xinhua News Agency reported. The largest overseas order for Wing Loong IIs was obtained even before the maiden flight, Xinhua reported. The report did not specify the buyer. A deal involving as many as 48 Wing Loong IIs, if confirmed, would be China's largest export deal for drones to date, Song Zhongping, a military expert and TV commentator, told the Global Times on Monday. Chengdu Aircraft Industrial Group did not confirm the deal when reached by the Global Times as of press time. It makes sense the aerobatic team was closely involved with the deal, Song said, noting that the team is expected to train the drone operators. The deal is trustworthy given the close military ties between the two countries and Pakistan's need for drones, Song said. US drones like the MQ-1 Predator and MQ-9 Reaper are technologically more advanced, but Washington limits their export, Song said. Chinese drones will enjoy more success in the international market in the future, he said, as they perform similarly at a lower cost. "Chinese UAVs (unmanned aerial vehicles) like Caihong series also has clients from countries like Iraq and Saudi Arabia," Song said.